Previously, we had taken a puppy training class through another service and were overall dissatisfied. We decided to take another stab at it through Tucker Pup's and are so glad we did! The trainer was extremely knowledgeable and the small class size allowed our trainer to both work with the group as a whole and make time to help us individually. The commands we learned are useful in every day situations and the other tips and tricks provided have been helpful as we continue training on our own. We had a great experience at Tuckers with Rachel and Brian. They were very attentive to each dog even though there were 4 others in the class. We saw great improvements with our pup Bauer and we are excited to see him continue to improve. We highly recommend this class and are even thinking of enrolling in the agility class this summer. David Roos was unreal. I was so impressed with his training and his strategy. Our dog was a piece of work, haha and David's patience and stern attitude really helped him become a better trained dog. I loved this training and LOVED David. He was exactly what we needed. We used Tucker Pups for Puppy 101 Training. David Roos is a fantastic trainer. He works well with the puppies and the owners, often correcting or tweaking little behaviors throughout the class. He is encouraging without being demeaning, like some trainers can be with stubborn dog owners. He ultimately wants the puppies to grow and adapt to be beneficial to the owners' lifestyle, and if something doesn't fit, he provides guidance on changing the command or behavior to something that does fit. I'd recommend David for any new puppy or owners. The outdoor leash class was very productive, and my dog is walking with out pulling, and also listening more. David was very professional and extremely patient with our puppy. His tips were helpful and we are continuing with our at home training. I would highly recommend Tucker Pup’s to all our friends! David is a great trainer! I emailed him a few times with questions and he was very responsive. The techniques he uses produce results. I would highly recommend him and Tucker Pup's for training. David and the puppy training class was great! My entire family looked forward to the class all week. 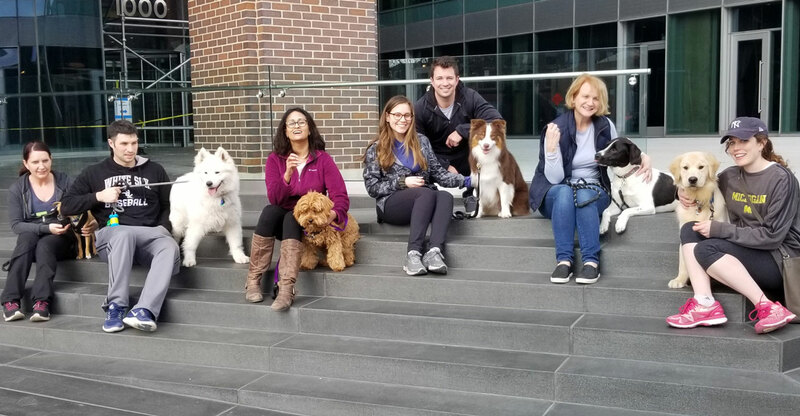 We learned how to train our dog easily through this class, including even our 8 and 10 year olds. We even learned tricks we didn’t know that we needed to know - like touch! After completing the puppy class our dog can sit, stay, lay down, and come when called. Very satisfied with the small class size and David clearly knows what he’s talking about. He was able to get any dog to do the task at hand easily! Classes were great, we learned a lot of training tips and tools that we will be able to use outside of class. David is a great teacher and is very knowledgeable. I just wanted to thank everyone at Tucker Pup's for doing a phenomenal job in every aspect of your services. We have been taking our dog Joey to daycare for the past 9 months and we have enjoyed the experience through its entirety. Joey loved going to daycare and the staff has been nothing but professional through our experience. We also had to board Joey a few times while we went out of town and they took excellent care of him while we were gone. In addition to this, we also went through puppy training at Tucker Pup's and that was an excellent experience as well. We unfortunately had to move due to being relocated for work and we will surely miss Tucker Pup's. Thank you for everything and I just wanted to let you know how great of a job you and your staff are doing. We just completed Good Manners One. I could not have been more impressed. Instructor trained us to train the dog. I especially liked that we did not bring our dog to the first class.This method made understanding how a dog learns that much clearer. We adopted an 8 month old Collie that had spent 6 months of his life in a cage. He had absolutely no training. At the end of the program he could sit, down, stay, walk on a leash, wave, leave food on command and was learing to roll over and play dead. Instructor was always on time, actually if we arrived early she was there and would happily answer any questions. We are planning on enrolling for Good Manners Two. I loved the course and instructor! I\'d recommend it to friends definitely! I learned a lot, and so did my dog. It was a lot of fun. My little wapoo (chihuahua/poodle mix) , Tank, was only 2 months old when he started going to Tucker Pups and he LOVES it! Everyone there takes such great care of him and he is always so happy to go play when I take him in. He is now 4 months and still loving it! The grooming services are fantastic and the Polite Puppy training classes are really working! Thanks to Tucker Pup\'s I have a well socialized happy puppy! I was really impressed with the class and especially the instructor. Theo is doing great and we've been working on things using the excellent training materials binder. We are happy customers and definitely found value for the price. I just wanted to send a quick repsonse back over to you about the puppy course. Everything did meet our expectations and the trainer was wonderful, knowledgeable and patient with is something I get a bit nervous about when Oscar tended to act up in certain situations. I would definitely recommend to a friend based on the success and progress we've seen with Oscar over the past 6 weeks. I felt it was time and money well spent and have noticed a significant increase in obedience and maturity since starting the course. With the methods covered in class I am confident we have a much better understanding of the tools we need to use in the future to continue to move forward in a positive and trusting relationship with Oscar. My fiancee and I will be discussing the Good Manners 2 course over the next several days and will likely be back in touch. The course did meet expectations and I would recommend the trainer and Tucker Pup's without reservation. The trainer was patient and gave clear instructions with good feedback. Since starting this class, Franny is more controlled and easier to handle. She is more responsive to us now that we know how to better manage her behaviors. She still gets distracted and will run away. That's why I asked about registering her for Manners 2. We greatly enjoyed the training course and will be enrolling in polite puppy II. The skills that our dog has learned is helping us to manage his lifestyle better. The training was very helpful and fun. The trainer was very good to work with and spent time with each dog in the class to make sure each was benefiting from instruction. The direction of what to work on at home were also beneficial. We would certainly recommend Tucker Pup's to friends and family. We enjoyed Good Manners 1 and will probably take the 2nd class down the road. Charger did really well, so I think it would be beneficial for him to continue. The class went well! Quinnie definitely learned some new obedience prompts and we use them in our day-to-day life. Since moving to the West Loop and using Tucker Pup's services, I have been very pleased. My dog, Scout, has been groomed at Tucker Pup's, and we recently finished the "Good Manners 1" course. Scout tied in first place as class valedictorian (or valiDOGtorian, as I call her). Whenever I take Scout in to Tucker Pup's, the staff are very friendly and kind to me and my dog. After grooming, Scout is clean as a whistle, and always in high spirits. I chose Tucker Pup's because I had heard many good things about the organization, and because the website was so friendly and easy to navigate. I have a dog walker from another local business, but would have hired Tucker Pup's as walkers if they offered that service. I plan on taking more discipline classes when my schedule allows.